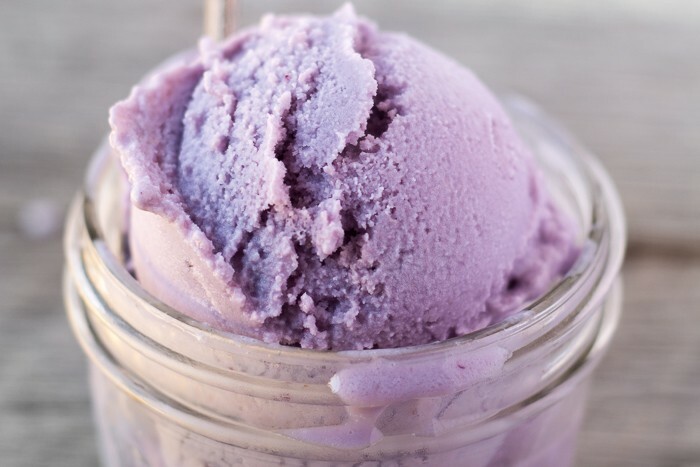 Concord Grapes are only around for a short time, so grab them when you see them for this healthy 3-ingredient Concord Grape Frozen Yogurt! Remove the grapes from the stems and put them in the bowl of a food processor fitted with the blade attachment. Puree the grapes until smooth, scrape down the bowl as necessary. Push the puree through a mesh strainer, cheesecloth, or a nut milk bag. Try to get as much of the puree liquid through, leaving just the skins and any seeds behind. Blend the yogurt with the strained puree and the honey until smooth. It might help to put it back into the (rinsed) food processor to do this. For best results chill this mixture before proceeding. Pour the chilled mixture into your ice cream machine and process according to directions. Spread the frozen yogurt into a loaf pan, cover, and put in the freezer for several hours or until firm enough to scoop.